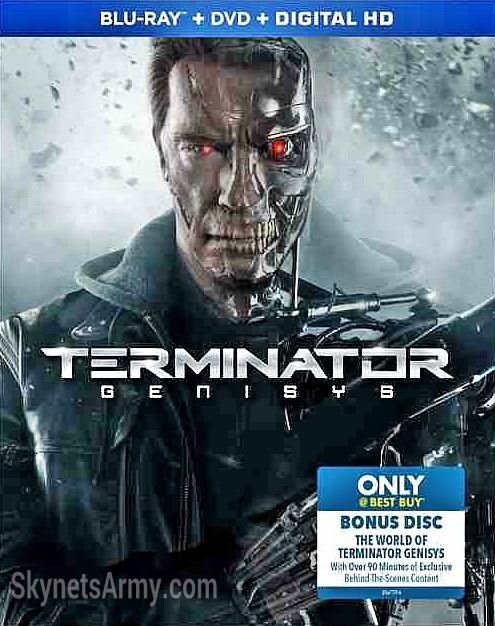 Some more information has become available regarding the “Terminator Genisys” Blu-Ray exclusive that will be available through the United States retailer Best Buy. Not only will it feature alternate cover art (seen above), but this exclusive version will include a BONUS DISC titled “The World of Terminator Genisys” which will contain over 90 Minutes of Behind the Scenes content not available anywhere else! There are also rumors of a Steel Book variant of this version, but that has yet to be confirmed. We’ll update you as more details are revealed. “Terminator Genisys” will be available on Blu-Ray and DVD in stores November 10th. Previous Post“Terminator Genisys” Star J.K. Simmons weighs in on the status of TERMINATOR 6 & 7!Next PostThe Future is not Set: What fate is in store for the “Terminator: Genisys” Trilogy?